I’ve written before about Religious Freedom Restoration Acts. Dut to all the furor regarding Indiana’s new law, and the way Georgian politicians suddenly backed down from theirs, I thought I’d talk about them again, and also clarify just what the furor is about. In general, as I’ve written before, RFRAs can have a useful function. On Monday I wrote a bit about Overselling. Of course, these days, with all the internet competition for eyeballs, practically everything is oversold. Case in point: An article from Yahoo — Why Is Stepping On A Lego So Painful? Science Has The Answer. Actually, I have a different answer. Wussitude. There’s an article that’s been showing up on my Facebook feed, about The Scientific Reasons Why You Should Just Always Be Naked. In it, it discusses going barefoot. But it oversells it, and gets it wrong. Their supposed reason for going barefoot just makes up the science. 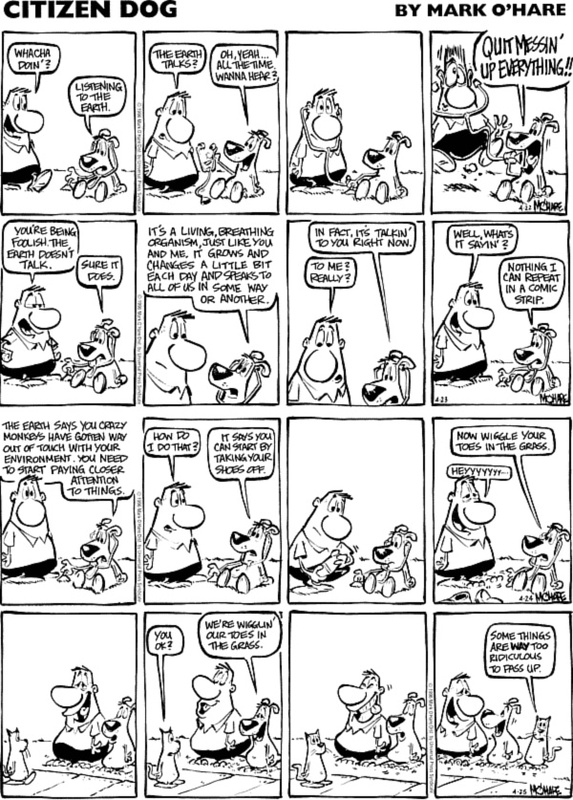 Today our comic comes from the strip, Citizen Dog, which ran from 1995 to 2001. I’ve put together a four-day run, which originally ran from April 22-25, 1996. I’m sitting here wanting to do another adventure Out West, feeling the Soul of the Earth under my feet.